Find More Great Holiday Survival Tips! Hosting a holiday party is no easy feat. Between creating a menu, shopping, cooking and cleaning, it’s no wonder we feel a bit stressed out. However, with just a little planning and ingenuity hosting your perfect holiday gathering can be easier than you think. 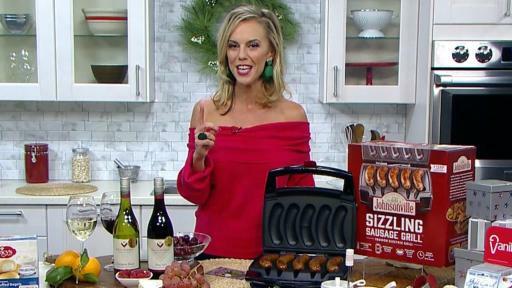 Entertaining expert and cookbook author, Brooke Parkhurst shares some of her party prep secrets, tips and advice for holiday hosting. Simple Refreshments: Keep it simple when it comes to the cocktails and stick with a great bottle of wine. Villa Maria’s Private Bin Pinot Noir is the perfect pairing for holiday entertaining. With flavors of sweet and tart red cherry fruit and dried herbs, this Pinot Noir is an elegant complement to traditional holiday dishes like turkey and roasted pork loin. Plus, it’s screwcap top makes for stress-free opening. Also, New Zealand is famous for Sauvignon Blanc and it’s a great option as an aperitif. It has notes of fresh herbs, lemongrass and ripe citrus. Serve it to your guests to enjoy with appetizers like chilled shrimp or as a first course with salads. Family owned and operated for over 50 years, they have an outstanding track record of worldwide accolades and are New Zealand’s most awarded winery. Think Outside of the Box: Just because it’s snowing outside doesn’t mean that you can’t fire up the grill inside. This holiday season, give the gift of grilling all year round with the Johnsonville Sizzling Sausage Grill. This indoor grill is easy to use and creates the perfectly cooked sausages every time in less than 15 minutes, all for less than $80. Its enclosed design seals completely when locked so that the sausages are cooked and browned evenly, the juices and flavor don’t escape, and no drippings splatter outside the grill. Users can grill a single sausage or five at a time, making the grill convenient for a single meal or multiple servings – perfect for quickly feeding a crowd during the hustle and bustle of the holidays! Use code “sizzle” by 12/10 at checkout on the grill’s website for free shipping and handling. Time Saving Tips: Don’t worry about making everything from scratch. There are now so many amazing frozen options that will not only save you time in the kitchen, but will allow you to enjoy your party while being able to replenish any dish within minutes. Nancy’s Petite Stuffed Bagels are freshly baked bagels, made with deliciously creamy Philadelphia Cream Cheese, and are ready to serve and enjoy in minutes. They have 4 exceptional flavors including: Original, Jalapeno, Pumpkin and Apple Cinnamon. They start with the same quality ingredients used in home cooking -- butter, flour, milk, eggs, fresh produce and herbs and premium cheeses. They’re perfect for anytime, whether it’s a quick snack, weekend brunch, game day or holiday entertaining, they are a true essential. Grab N Go: Shopping for presents can be stressful, so it is no surprise that for the 11th year running, gift cards are at the top of everyone’s holiday list, making them the perfect holiday gift. Instead of breaking your back going from store to store, just pick up a stack of Vanilla Gift Cards. The recipient will enjoy the freedom to get whatever they want, wherever Visa or Mastercard are accepted – from grocery stores to pharmacies, and the funds never expire. That’s holiday shopping made simple.